Yesterday was another opportunity to fly without presenting any ID at the airport. The man at the US Airways counter didn’t give me much trouble beyond the puzzled look and a few questions about how it’s possible to not travel with ID. Going through security was easier this time than last time as they did not frisk me, but they did give me a little bit of trouble while going through my bag. The first item that got me a few questions was my all metal mechanical pencil (click here for a review). As you can see in the review, the pencil is quite heavy and solid, so I can understand their complaints. In the end, they did not take it away. What was more amusing, was the concern that the two security guys had over my laptop. I currently am missing 1 key off the keyboard from switching the layout to Dvorak (I still have the key, but need to modify it for it to go back on). The guard spent a minute looking at the missing key to see if there were any apparent modifications to the laptop, when he noticed that the keys were not in the right places. He had never heard of the Dvorak layout and, apparently, did not know that layouts other than qwerty existed. I guess my explanations of a more efficient layout were not good enough, and they asked me to turn the laptop on to verify that the “internals have not been modified”. I really wanted to tell them that I have modified the internals, but discretion got the better of me. So I turn the laptop on, and they get to see LILO in all its glory boot Gentoo. Although they were satisfied that the machine was operational, they were not happy that it was using software that they had never heard of. I explained what an operating system was to them and the difference between Windows and Linux, but I don’t think I cleared much in their minds. To see their reaction, I refused to login to the machine when they asked, which prompted them to bring aver their supervisor (an actual TSA agent rather than hired security). I explained the whole Dvorak and Linux thing to the supervisor, who seemed to be a little more understanding. She felt that turning the computer on was enough and let me go. The trip through security was relatively painless despite the issues that they had with my computer. I think that this shows that there is a fundamental lack of understanding of how computers and electronics in general work. If I had told the security that I was an electrical engineering student, I’m sure that they would have given me more of a problem with the computer. If security really wants to deal with modern electronic threats, they need to start educating their guards in the matter. There are much more dangerous things than Linux that can be brought onto an airplane, not to mention things that are much less conspicuous than a laptop running totally unfamiliar software. Something that comes to mind would be a radio jamming device that could easily be concealed within an operational laptop, calculator, etc. I understand that I am in a much different position than many people who do not use such electronics everyday, but if people are going to spend billions of dollars on security, shouldn’t they actually be familiar with the kinds of threats that can occur? Or, perhaps, it is just the notion of “security” that is the aim. It is clear to me that actual security is trivial, a superficial glaze is all that is necessary to make people feel safe. Personally, I think the fear that people have in regards to air travel security is absurd, so maybe its a good thing that there still is no real security at the airports. Life is hazardous to your health. Deal. 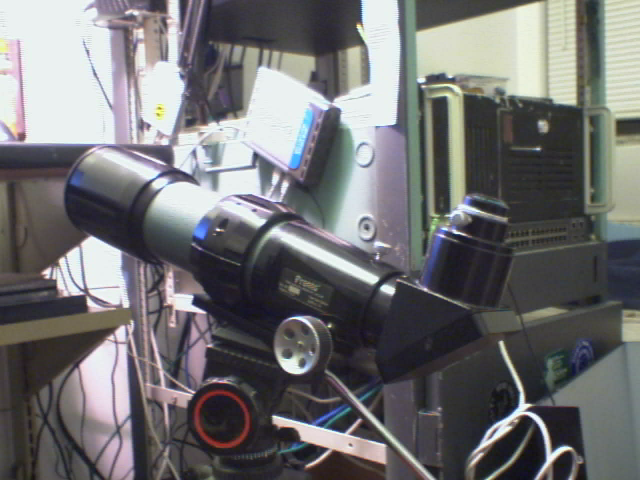 In researching information about using a webcam as a low cost camera for astrophotography, many people recommended the Philips SPC900NC camera due to its use of a good quality 1.3 megapixel CCD sensor at a decent price. I bought mine from ebay, but its also available on Amazon and Newegg. My first attempt at playing with this camera was on my main desktop running Windows XP x64. This proved useless, however, as the drivers will not work. The Philips software will install fine but it cannot recognize the camera. Windows detects that a USB device is plugged in but can’t do anything with it because of the incompatible driver. I currently do not have a 32 bit version of Windows XP, so the next course of action was obviously Linux. My laptop currently runs Ubuntu (was running Xubuntu until yesterday, just did a little swap of GUI’s) and was a prime choice. The camera did not work “out-of-the-box” as can be expected, but a little searching netted me a working driver for the camera, known as pwc. The pwc driver works for many Philips cameras, including the SPC900NC that I’m using. Installation is very straightforward for anyone who has compiled programs. Once the driver was installed, Camorama didn’t have a problem detecting the camera and capturing images from it. Next step is to work on capturing video from the camera, which mplayer may do for me. Now that I’m safely at my destination, I can continue where I left off. Recently I’ve been trying to see how long I can extend my battery life on my Thinkpad T30 (aka darkstar, running xubuntu). One of the methods I’ve been trying is not starting x (and thus not starting xfce). Of course there are a lot of variables that determine battery life, but so far under normal use I seem to get about 30 more minutes. Normal use would be internet (elinks vs firefox) and typing (nano vs open office). I’m going to continue to track battery life over time to get a better estimate over longer periods of time and for different amounts of CPU usage. In an airport just doing a test of elinks. Working better than I expected on wordpress, glad to see that they’ve included text only support. I’ve discovered that my battery life is extended when I don’t start X on my laptop. More on this later, they just called my flight.